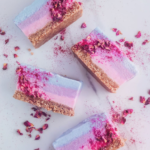 Last month, our Instagram community created some inspiring new recipes, from savoury French Toast and flatbread, to colourful parfaits and nutritious smoothies! 1. Mix the dressing ingredients together and set aside. 2. Preheat oven to 180oC. 3. Slice the sweet potato and drizzle with 1 tbsp of olive oil and bake for 40-50mins until cooked through and nicely caramelised. 4. Meanwhile, make the cauliflower marinate by mixing the miso paste, 1 tbsp tamarind or soy sauce, rice wine vinegar and 2 tbsp of olive oil. 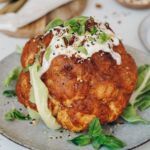 Coat the cauliflower florets well and bake for 25-30mins until softened and golden brown. 5. For the coconut bacon (makes a big batch), mix together coconut flakes, 1 tbsp of olive oil, 2 tbsp of tamari or soy sauce, the smoked paprika, and 1 tbsp of maple syrup or sweetener of choice with a pinch of salt and pepper. 6. Bake in the preheated even for 5mins, flip and bake for another 5-7 minutes until golden brown. Cool down before serving. 7. Pan fry the corn with a touch of olive oil until just cooked. They should be crisp and bright yellow. Remove the corn and set aside. 8. 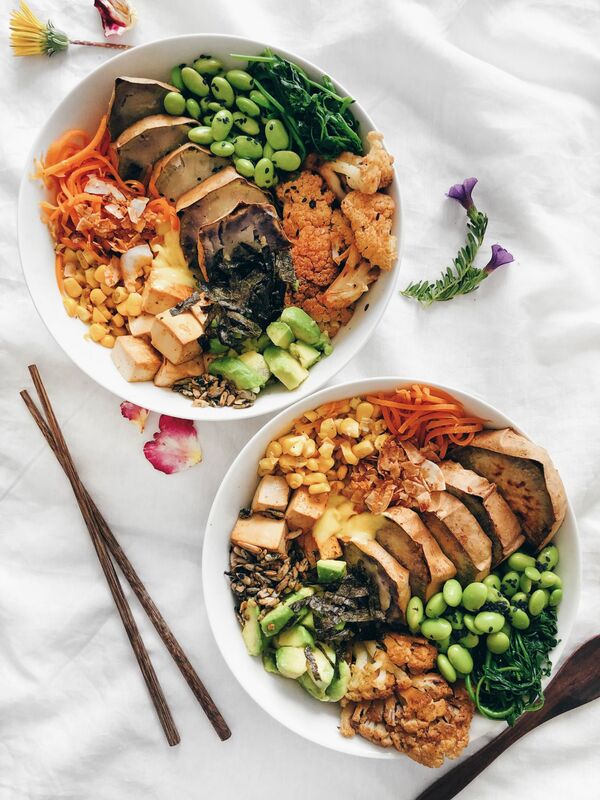 For the teriyaki tofu, make the sauce with 2 tbsp of tamarind or soy sauce, 1 tsp of rice malt syrup or maple syrup and 1 tsp of sesame oil. On the same pan heat a tbsp of olive oil in a fry pan and fry tofu till golden brown on both sides. Turn off the heat and drizzle the sauce over, make sure the tofu is coated well with the sauce. 9. Assemble the bowl by placing the greens on the bottom of the bowl as a base. 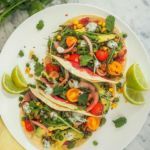 Top with cauliflower, tofu, avocado, sweet potatoes, corn, carrots, edamame, and coconut bacon. Drizzle with the coconut yoghurt dressing and sprinkle with chopped nuts, nori and black sesame seeds. 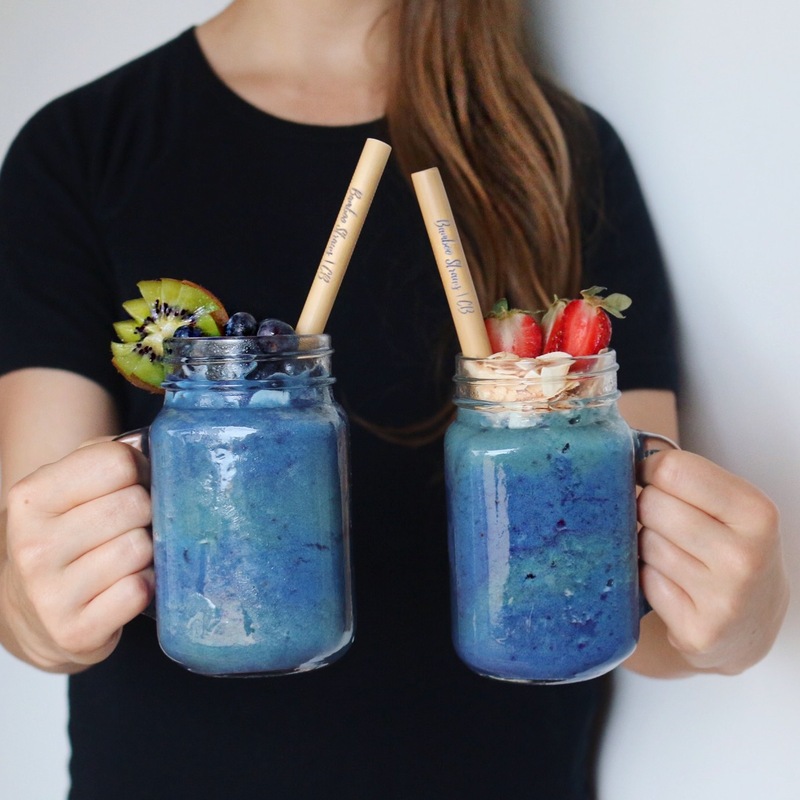 Enjoy the health benefits of blue spirulina in this tropical flavoured smoothie! 1. Place all ingredients and 1 teaspoon of spirulina into a blender, and blend until smooth and creamy. 2. Pour half of the smoothie into a pouring jar. 3. Add the remaining 2 teaspoons of spirulina into the blender with the rest of the smoothie. Blend, and pour it into another pouring jar. 4. Slowly pour one colour than the other until you get different coloured layers. 5. Add your choice of toppings, and enjoy! A comforting breakfast that can be enjoyed on its own or with salad. 1. Mix the dry ingredients together to combine. 2. Add the coconut yoghurt and water to the dry ingredients, and mix well. 3. Soak bread in mixture, and flip to coat both sides. 4. Melt butter in a fry pan over medium heat and once almost melted add the bread slices. 5. Fry for 3-4 mins on both sides, or until golden. (Lift and check, you don’t want it to burn!). 6. Once golden, take off heat and tuck in! Slice it, leave it whole, serve it with chutney or sauce. Create a tasty accompaniment to your dinner with this quick and easy flatbread! 1. Mix all but the butter together let sit at room temperature for 10-20 min. 2. Roll out to desired thickness and cook on a dry pan for 45sec each side or until some brown spots appear. 3. Take off the heat and spread the dairy free butter, if using, on one side. 4. 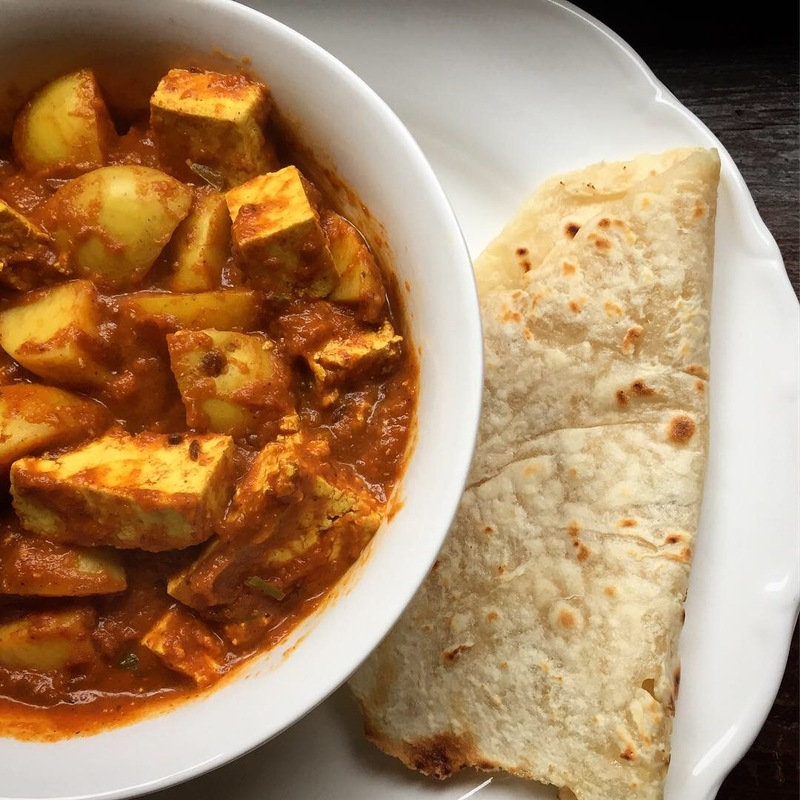 Serve warm with curry, as a pizza base or as a wrap. NOTE: For a thicker more Naan like flat bread replace all-purpose flour with self raising flour. To increase quantity or for a bigger flatbread, use a 1-1 ratio of flour to yoghurt. 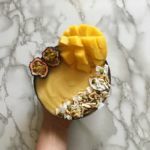 Why have just choc mango oats, matcha chia pudding, or raspberry coconut yoghurt when you can have all three?! 1. Start by combining all your ingredients for the chia pudding in one bowl, and the overnight oats in another bowl. Leave to set for at least 1 hour or overnight. 2. In a separate bowl, combine your raspberry yoghurt ingredients and stir until the raspberries have thawed and the yoghurt turns pink. 4. Assemble your parfait in a jar by layering the chia pudding, oats, raspberry yoghurt and chopped berries. Top with coconut flakes, strawberry slices and kiwi. Enjoy! 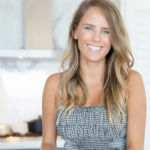 Are you getting busy in the kitchen with Cocobella? 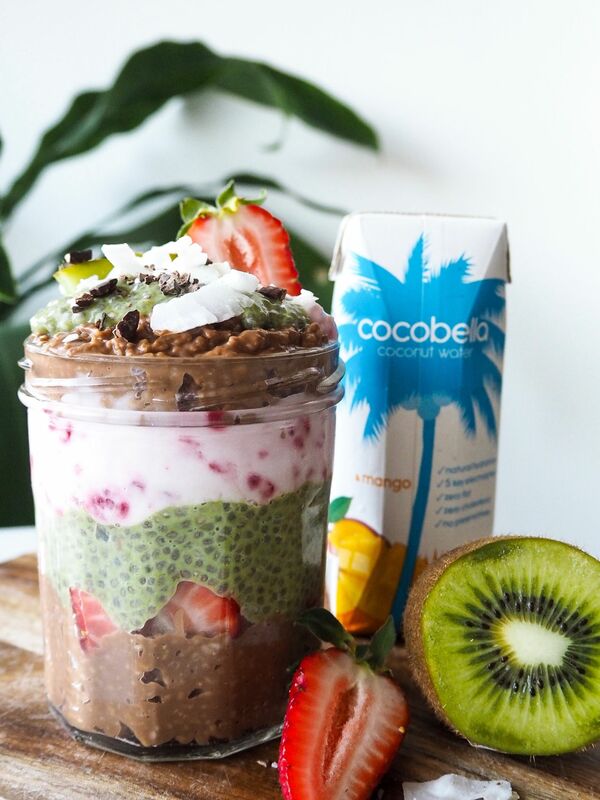 Don’t forget to tag @purecocobella and #cocobellarecipe. We love seeing what you’re up to!